Photographer is Oscar Smith (“Successor to Adolph Westphal”) of Chicago. Otherwise undated and unidentified. Normally I look at a photo like this and I think “Oh, how pretty”. But for some reason today I’m looking at it thinking “What on earth is it like to launder that dress? It must be like laundering the drapes!” I am also struck by the way that bustly dress couldn’t possibly fit comfortably in the tiny seating area of that chair (not to mention the chair is missing some fringe). By the way, the photographer’s advertising on the back includes Copies from old Pictures enlarged to any required size, and finished in Oil, Water Colors, India Ink and Crayon. It’s fun to imagine with he might have done with this one. I can answer two of your questions. First, the dresses were not laundered in the way we wash clothing today. Since the most common fabrics were wool and silk, they could not be dunked in a pot of hot water as that would ruin them. So, dresses were spot cleaned and only in the most dyer cases washed completely. Second concerning how to sit, well with a bustle dress, there’s a whole lot of air underneath it, so the lady sort of hitched up her skirt and then sat down. She would have sat on that chair sideways rather than having her back against the backrest. 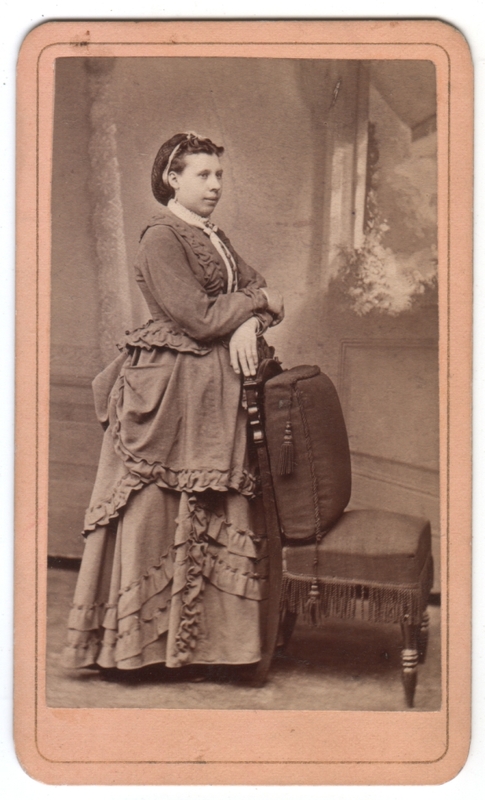 Corsets prevented slouching anyway so the backrest was really for men and children. 🙂 You have a nice example of the first bustle period dating from 1870-1876. At first I thought that there was a wave breaking through the window in the backdrop. Okay, so I didn’t have my glasses on, but even with them on I cannot figure out what it is supposed to represent. Really interesting info about the cleaning of clothes in those days from Mrs Marvel. Just getting to this now, though harriedcostumer already replied. I agree with what she said. What looks like foam is plants in a window box. Very helpful comment from Mrs. Marvel. More re: laundry: I was told by a docent at the LA County Museum of Art that 18th-century clothes were (infrequently) completely taken apart and washed in vodka. I don’t know if this method survived into the 19th century. Great links! Thanks for providing them. The variety of bustles shown here suggests that there must have been accommodations made at times for women to be able to sit. I had heard that about the vodka wash as well but I don’t know of any references to it in the 19th century. Unfortunately we can’t even test it on comparable fabrics because so many of those lovely fabrics are either not produced or are impossible to be reproduced, e.g. certain silk worms are extinct so that kind of silk can no longer be made, etc. That’s so fascinating about the silkworms, I had no idea. It reminds me of efforts to save “heritage” crops in an effort to reproduce historical meals. Thanks for the input. He did a whole series of laundress pictures–it was a common form of work poor women could take in. “It was a perfectly appointed, small steam laundry, wherein the most modern machinery did everything that was possible for machinery to do. Martin, after a few instructions, sorted the great heaps of soiled clothes, while Joe started the masher and made up fresh supplies of soft-soap, compounded of biting chemicals that compelled him to swathe his mouth and nostrils and eyes in bath-towels till he resembled a mummy. Finished the sorting, Martin lent a hand in wringing the clothes. This was done by dumping them into a spinning receptacle that went at a rate of a few thousand revolutions a minute, tearing the matter from the clothes by centrifugal force. Then Martin began to alternate between the dryer and the wringer, between times “shaking out” socks and stockings. By the afternoon, one feeding and one, stacking up, they were running socks and stockings through the mangle while the irons were heating. Then it was hot irons and underclothes till six o’clock, at which time Joe shook his head dubiously. You’re right, that’s a vivid description. I’ve said it before, but I’m really fascinated with the mundane daily life of people years ago, and how things were different from the way they are now. Something as simple as laundry is something we take for granted, but it’s not like they had modern machines or detergents then. Thanks for all your input. The mangle is a wringer if anyone caught that. 🙂 I bet you know where the verb mangle came from now, don’t you? I believe its supposed to be an open window with an awning, showing a cloudy sky, plants in a windowbox, and a tree not quite out of sight on the left. I need to wear my proper glasses more often. I can see it now. I knd of liked the surreal feeling my imagination gave to the scene, though!